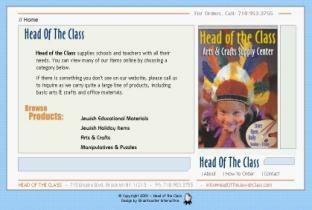 Head of the Class sells Judaica educational and arts and crafts items with a special emphasis on pre-schools.Their items include Jewish educational materials, Jewish holiday items, arts and crafts and puzzles. The company sells these items to schools and teachers and carries a full line of special education products. Judaica opted for an Ecommerce web design by Bitochon to broaden its potential consumer base. Now customers nationwide can purchase items from this specialty store. Shoppers can browse and shop the full line of available, easily viewable merchandise at their convenience. Products can be purchased with just a click and a credit card. The Ecommerce website design and development allows Head of the Class to add new products as they become available without the assistance of a programmer.